Neste only accepts sustainably-produced renewable raw materials from carefully selected partners. Sustainability of the raw materials used in the production of renewable fuels is a minimum requirement that must be in order – even the law requires it. 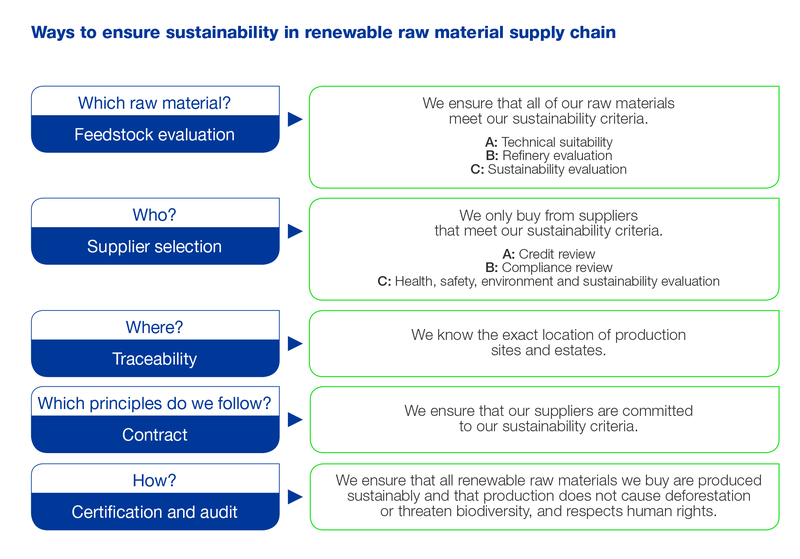 Neste’s supply chain management is based on company’s sustainability policies and principles. Our proprietary NEXBTL technology allows the use of almost any vegetable oil or waste fat in the production of renewable products. In recent years, we have not only expanded our raw material portfolio but also significantly increased the share of waste and residues in our total renewable raw material usage. Approximately 80% of our raw material usage is waste and residues formed in industrial processes, such as waste animal fat or fatty acid distillates, which are vegetable oil processing residues (e.g. Palm Fatty Acid Distillates, i.e. All palm oil sourced by Neste is ISCC certified and supplied by carefully selected plantations in Malaysia and Indonesia. We do not purchase separate certificates from the world market as many food industry companies do, for example, but source the certified palm oil directly from producer companies. Buying directly from producer companies provides us with better transparency and influence in our supply chain – the more direct the supply chain, the better. Sustainability of our supply chain is one of focus areas in our sustainability work. More about it in our Sustainability Report.